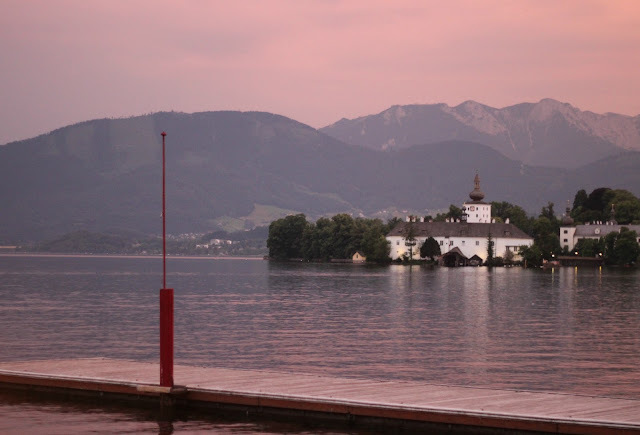 Our second-last stop on our Interrail* trip was the beautiful lakeside town of Gmunden in Upper Austria. Helen and I both both decided that we needed to split up our city exploring and visit somewhere serene and calm on our travels. 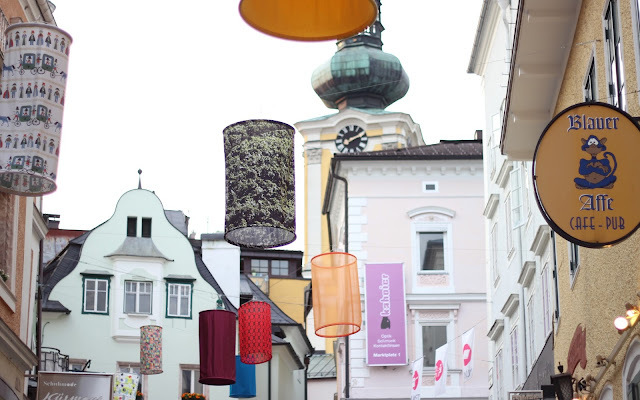 Helen spotted Gmunden on the map and after we both looked up about it online, we fell in love instantly. 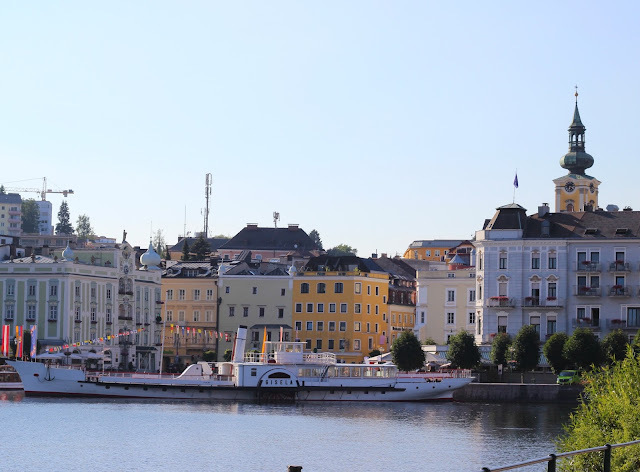 If you're heading interrailing, I highly recommend finding at least one place that isn't a busy city. You'll need to recharge your batteries and being away from pollution, fumes and crowds does everyone the world of good. Gmunden was a tourist spot for mainly Austrians and Germans, we were the only English-speaking people there at the time - that we knew of. Despite this, the language barrier wasn't too tough and the townspeople were so polite and helpful. The young Austrians we did meet, mostly waitresses at bars, were more than happy to practise their English with us for a chat. 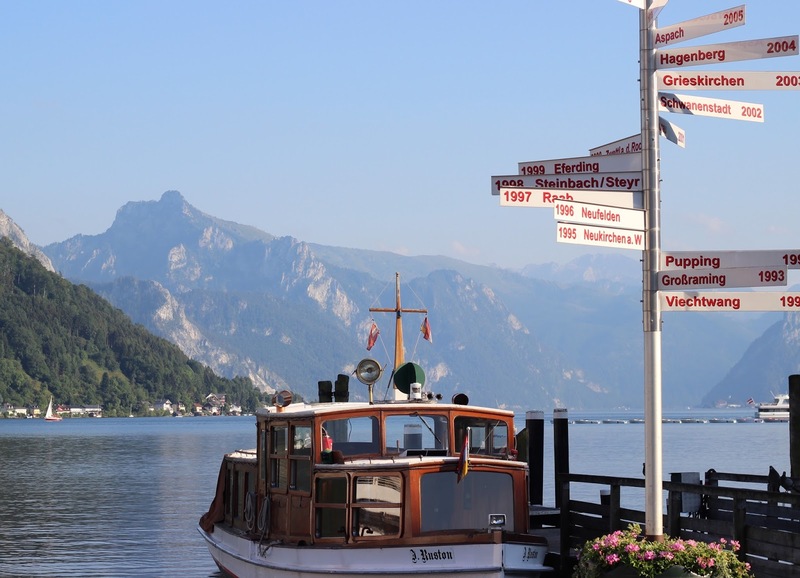 I think of all the places we went, the people of Gmunden were the warmest. 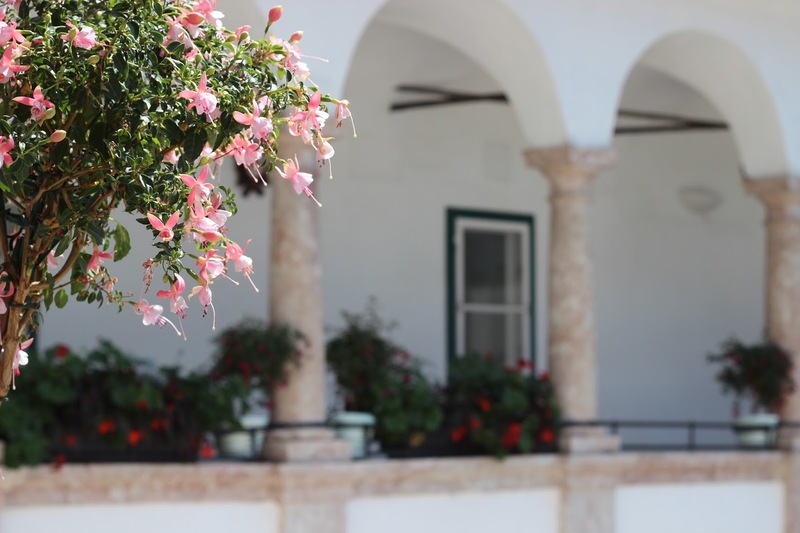 Our Airbnb* in Gmunden was located at the top of one of the hills and despite walking in the scorching heat, up and down every day, we adored it. Our host was really lovely and helpful. The place itself was comfortable, spacious and modern. We got taxis to and from the train station with our luggage here, which cost us a mere €7 each way. The food in Gmunden was quite similar to Berlin but a tad more traditional. We opted for Italian on the first night, of course. 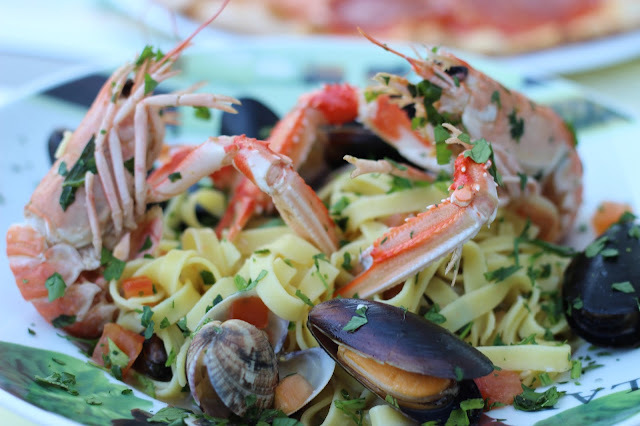 I'm not used to seeing prawns with their legs and claws so admittedly had quite a scare when they arrived out on my pasta dish; I found the seafood to be quite, er, in its natural state when I ordered it here. As in, an actual whole fish - eyeballs and all - on my plate too. I'm quite a wimp when it comes to well, everything food-wise, and seeing the bones, guts and eyeballs of my food frightens me a tad. Be prepared for that if you go here, haha. Otherwise, we dined like queens. We ate gorgeous bread rolls from the supermarkets (around 40c a pop), bought some treats in the local Spar and of course, devoured absolutely everything and anything that had Nutella on top. 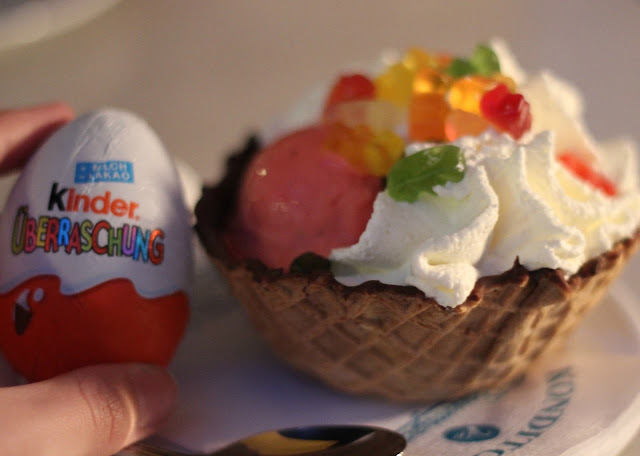 My sweet tooth went a bit crazy in Gmunden, I must admit. Price-wise, everything was affordable but quite similar to Irish/ UK prices. One thing that we were unaware of was that if a basket of bread rolls is put in front of you in a restaurant, and you eat the bread, you're charged per bread roll you eat. Usually bread baskets are complimentary with meals in other countries, including Ireland, but the waitress told us that it's just the way they do it there so keep that in mind! We tended to eat most of the bread in the bread baskets in the other places we visited to fill us up, or wrapped them in tissue and took them with us (sounds scabby but if you're on a budget, there's no harm in doing it if they're going to be thrown into a bin anyway). 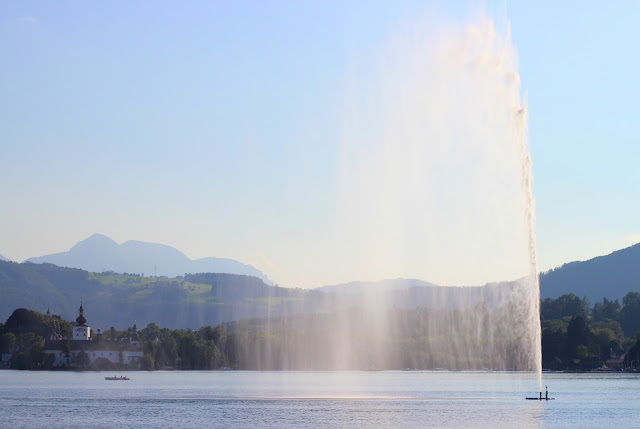 Helen and I were absolutely living to go swimming in Gmunden's beautiful lake and we weren't disappointed when it came down to it. Gmunden has a lakeside beach-like area (with stones, not sand, ouch! ), a volleyball court and a gorgeous bar serving food and drink. There were families and groups of friends around when we went but plenty of room to put our towels down, read and relax. The water itself was the clearest I have ever seen, it was sublime. After travelling for over a week, it was pure heaven to sit down, relax and take a few deep breaths to unwind. The heat during the day was possibly the warmest I've ever personally experienced so I found I topped up my suncream (SPF 50, of course) at least 3 times in the 2 hours we were there. Ireland has had an atrocious Summer this year so I felt like I still got my little bit of sunshine paradise swimming in Gmunden's lake. We visited the local castle, Schloss Ort, in Gmunden on our last day. The building itself was beautiful to see and walk around but there wasn't that much to look at or do otherwise. We had to pay around €4 to get in and didn't find there was much keeping us there after 20 minutes or so. There was a bar and restaurant attached to the back of the castle but we didn't stay. If you're heading here, it's worth a visit if you've an hour or two to spare for sure. The woods surrounding it are great for photos. Gmunden was a unique and peaceful adventure for both of us and I'm delighted we decided to go somewhere 'away' from everything to break up our trip. It gave us both the energy and positive mindset to head on our next train journey to Paris, which was going to be a whopping 10 hours long (gulp!) but more on that next time..
Whilst there, we found out Gmunden is really popular in the Winter also for snow sports, which would obviously make sense seeing as how incredible the surrounding mountains are. If any of you are ski-lovers, definitely check this place out as it looks AMAZING during the Winter judging by photos we saw. 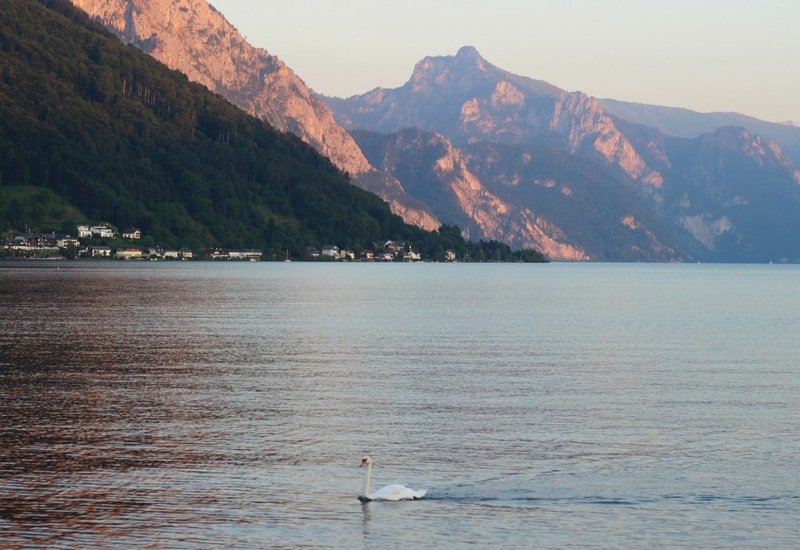 Gmunden is a very special place, between the mountains, friendly swans, welcoming occupants and glorious weather, there's really not much else to say about it other than wow!